74% of customers say this fits as expected. 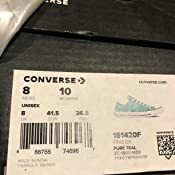 Perfect fit, really good quality and just what I would expect from Converse. I like them because they hold up well and are comfy right out of the box. The size fit well and the color looks great as expected. 5.0 out of 5 starsAmazing shoes! But pay more attention to the seller! They are amazing! Comfortable, came on time, and no damage to the product or defect. Very comfortable and would recommend to others. When I was looking for reviews, I saw alot of negative reviews about them being "fake" and some are and some aren't, Its just who you buy it from. Before buying do a backround check on the seller. If they have good reviews and have a reasonable price, buy it. If they don't have good reviews but it's selling cheap, save your money because it's not worth getting fakes that last 3 months. 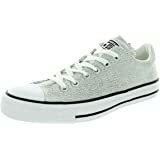 Although the listing says “Women's Chuck Taylor All Star 2018 Seasonal Low Top Sneaker” the sizes are men’s. I ordered an 8 and received N 8 Men’s/10 Women’s. Super frustrated and returning, obviously. 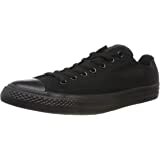 5.0 out of 5 starsPerfect lightweight substitute for Chucks! 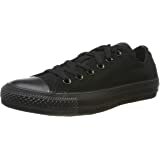 I love the look of Converse, but found the typical Chucks didn't work for me. Too heavy and I wear a half size. Well these Dainty All Stars are exactly what they claim to be: dainty. They seem to weigh about half as much as the other Chucks. Plus, they come in the size I needed, a 7.5. They have a little room to spare, in case I choose to wear socks or a little cushion, but probably not both until I break them in. 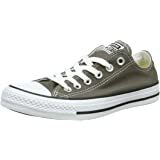 I would definitely recommend these if you wear a half size or find the regular Converse Chuck Taylor All Stars a little too heavy for your taste. Hit and miss with the Chuck IIs. I've worn a few pairs of these for a bunch of walking while traveling (10+ miles/day). 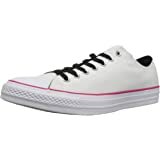 1) The Lunarlon insoles make these sooooo much more comfortable than the old Chucks, especially for walking around. 2) Though some folks aren't a huge fan of the styling (missing the racing stripe and all), it has grown on me. 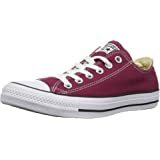 I like the burgundy shoes with burgundy laces, black shoes with black laces. 3) They fit like regular shoes should fit. 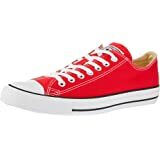 Order your regular size, or a half size larger than what you wear with original Chucks. 1) Longevity leaves some to be desired. The middle part of the sole on two pairs has come apart from the edge on two different pairs. The rubber seems to wear faster than the older Chucks. 2) Some problems initially wearing them with the Lunarlon insole. The fabric that is glued on to the insole sometimes comes loose and starts peeling off. This is quite uncomfortable to have rubbing around on your heel. 4.0 out of 5 starsGreat shoe! I love these shoes, I have ordered additional pairs in this style. 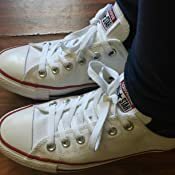 It's much more feminine than the traditional converse. The only thing I would say negatively about these is that they are uncomfortable without socks do to the metal grommets; so wear socks! 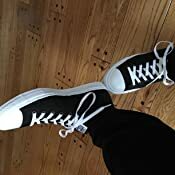 I finally killed my original chucks in under a year this time, by blowing out the back heel. I opted to finally give these a shot even though they are almost double the price, but I was excited to at least give them a shot before considering crawling back weeping to a brand new pair of the originals. The first thing I noticed was the elastic tongue stays on the inside of the shoe, I don't personally find these necessary but I do think it's a great addition for those who don't like the tongue sliding from side to side. It's pretty neat to think about decades of complaints about the tongue sliding all over the place. Secondly, these don't weigh a TON like the classics, I don't feel like I am dragging bricks everywhere when I am picking up my feet. Thirdly, I did not need to put in insoles in these at all. That means less weight put into the shoe itself to make it comfortable. I like that. 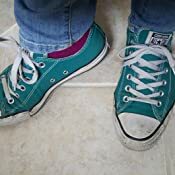 My only physical shoe complaint is that they are now just a smidge smaller than the classics in width and overall fit. 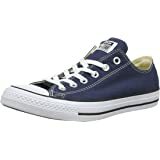 If a company is gonna do such rad things to the chuck, then at least offer this in a wide for those who want some wiggle room (or like to wear thick socks in the fall and winter) it just makes sense to not leave out an entire market of people with wide feet from getting to buy these kicks. I'm stuck in between standard and wide widths, so this is always a gamble I make when buying shoes. it's just a touch uncomfy, but it's livable for me at least. 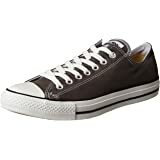 My only actual cosmetic complaint is I miss the silver lace eyelets, the sidewall stripes, and of course, the white stitching that for me is synonymous with the Chuck Taylor shoe. but oh well, I can sacrifice what I find pretty and appealing about a shoe because these are so comfortable! Stitching is different compared to my real Converse & quality/weight doesn't feel the same.